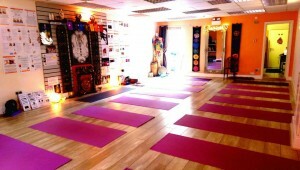 Welcome to Yoga You Sanctuary- A Warm Welcome Awaits You! Regardless of how fit (or unfit!) you feel, or how much prior experience you have of Yoga, I have developed a range of enjoyable, friendly and informal classes just for you. Everyone is welcome at our beautiful studio, a little dedicated space and oasis of calm at Yoga You Sanctuary 235 Liscard Road, Wallasey, Wirral, CH44 5TH (Click here for location, directions,parking & contact info). If you are completely new to Yoga, or a beginner, there’s no need to feel embarrassed or anxious that you won’t be able to do it – you will, because I treat everyone as an individual and structure my classes to suit and support each of you, giving advice and modifications as necessary. Alternatively, if you’re an experienced Yoga practitioner, my classes allow you to challenge yourself at your own pace as I have designed a number of programmes that will help develop your skills and knowledge further – physically, mentally and spiritually. Yoga offers you wonderful benefits during and after Pregnancy – please see our Classes page for more information and read some of our client’s amazing Birthing Stories. Please visit the Your Pregnancy Support Team page and learn more about the individual therapists and the services we offer. You can also download a PDF version of our therapist flyers for more information. Why not empower yourself with self-nurturing, health-sustaining Yoga or Pilates practice. Yoga You Sanctuary welcomes students of all abilities. Have a look at the Class descriptions to see what is most appealing to you, or perhaps think about booking yourself on to one of our many Events, or treat yourself to any of our Complementary Therapies listed…that may be just the ticket to enhance your well-being! Why not treat a friend or loved one to a very special gift? Our gift vouchers can be used for a wide variety of classes and events and the vouchers are valid for one whole year .Contact us here at Yoga You to organise a voucher to the value of your chosen activity and give a special someone a gift of love and positivity.